Mangaluru, Nov 01, 2018: Tulu film Paddayi, which won a national award for the best Tulu film this year, has been selected for screening under the Indian Panorama section of the 49th International Film Festival of India (IFFI)-2018 to be held in Goa next month, the Information and Broadcasting (I&B) Ministry announced on Oct 31, Wednesday. Sanjay Leela Bhansali’s Padmaavat has been selected under mainstream films category for screening at the festival, which is scheduled to start in Panaji from November 20 and conclude on November 28. 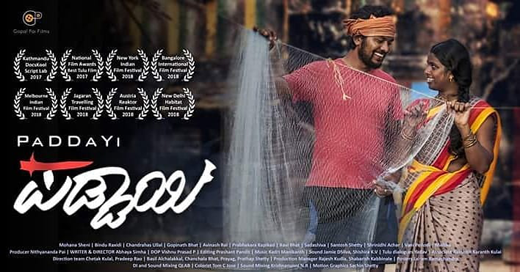 Malayalam feature film Olu, directed by internationally acclaimed filmmaker Shaji N Karun, will open the Indian panorama section of the IFFI-2018. A 13-member feature film jury, headed by noted film director and screenwriter Rahul Rawail, selected a total of 22 feature films including Paddayi and Olu for screening at the IFFI’s Indian Panorama section. These 22 movies included award winning Jasari language film Sinjar, Ladakhi film Walking with the wind, two Marathi films including award winning Dhappa, four Tamil films including Cheziyan Ra’s To Let, five Bengali films including Nagarkirtan, and six Malayalam films including Jayaraj’s Bhayanakam, which won three trophies at the 65th National Film Awards this year. Four mainstream films were selected for screening under the Indian Panorama section of the 49th IFFI-2018. These four mainstream films included Meghna Gulzar’s Raazi (Hindi), Ali Abbas Zafar’s Tiger Zinda Hai (Hindi) and Nagashwin’s Mahanti (Telugu).